These are just a few notes from the notebook I used while watching attorney Richard Ruggieri’s closing statement in Brandon Maxfield’s case, which was the first time I saw the attorney ‘work.’ The note in the upper right references how Ruggieri had told his young client not to attend due to the sensitive, difficult issues Ruggieri would be talking about. 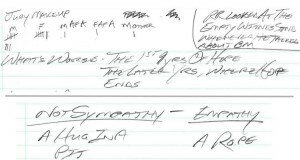 Upper left are quick notes about the jury, and below are notes about Ruggieri explaining that he wasn’t asking for sympathy for Brandon, but rather for empathy. Although I’d done some research on the story prior to this day, Ruggieri’s closing statements and his masterful connection with the jury convinced me to write Move To Fire. This entry was posted in books, courtrooms, current events, law, writing and tagged books, Current Events, journalism, Law, nonfiction books, research, writing on July 22, 2016 by Mike.